Facebook has started testing use of Aadhaar as an example to encourage new users in India to use their real names on its site. The latest move is aimed at curbing the number of fake accounts on the social media platform that has over 241 million users in the country, making India the second largest market for Facebook after the US. Facebook's mobile site is testing the 'name as per Aadhaar' prompt when users create a new account. "What's your name? Using the name on your Aadhaar card makes it easier for friends to recognise you," the prompt reads. The testing was first spotted by users on Reddit and Twitter. Notably, not everyone can see this prompt when creating a new account via the Facebook mobile site. We weren't able to reproduce the prompt. 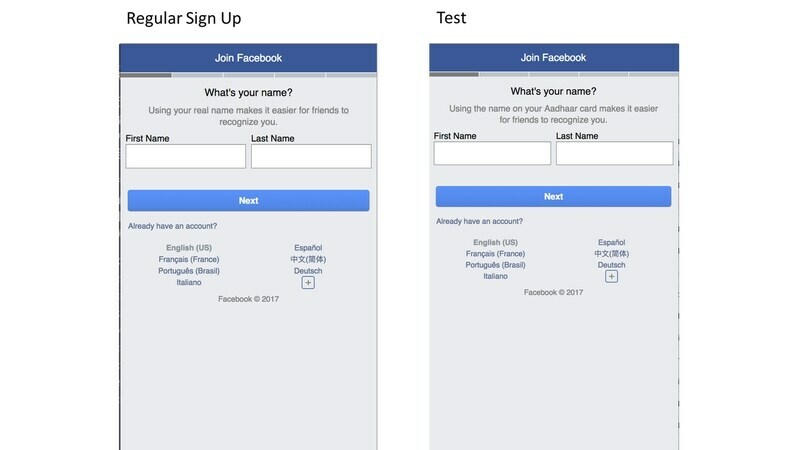 A Facebook spokesperson confirmed to Gadgets 360, "We want to make sure people can use the names they're known by on Facebook, and can easily connect with friends and family. This is a small test where we provide additional language when people sign up for an account to say that using the name on their Aadhaar card makes it easier for friends to recognise them. This is an optional prompt which we are testing, people are not required to enter the name on their Aadhaar card." It is worth noting here that Facebook is only asking the users under its pilot programme to sign up on its social network using the names that are available on their Aadhaar cards and doesn't request any Aadhaar details. The move doesn't raise further Aadhaar privacy issues, and risk of possible misuse doesn't increase. Normally, we don't report on developments in an app or service's onboarding process. But the attempt of using Aadhaar - which is currently embroiled in its own privacy controversies - as an example to enhance real name usage on Facebook makes it stand out. India is currently one of the fastest growing markets for Facebook - in addition to being the second-largest market after the US. This has so far influenced the Mark Zuckerberg-led company to actively bringing new features specifically for Indian users. The social media giant faced huge criticism for violating the fundamentals of net neutrality by launching its Free Basics in 2015. Nevertheless, it brought a list of India-centric features in the recent past to enhance its user base in the country. Facebook started testing its 'Express Wifi' service in India in 2016 to offer high-speed internet access through 125 rural Wi-Fi hotspots. Last month, the Menlo Park, California-headquartered company announced its two programmes to train about five lakh Indians on digital skills by 2020.